I love ravioli and I've made it once in my lifetime. I even documented it on this blog when I posted the recipe for Ricotta Squash Ravioli. I have to be honest, it was quite tedious and I wasn't exactly jumping to plan my next ravioli dish from scratch. In fact, it has taken me approximately 4 years to even think about making them again. When Grace of The Spoiled Mummy asked me to share a quick and easy recipe for the whole family to enjoy, I immediately tried thinking of a way to make raviolis less intimidating . Wonton wrappers! Instead of making the pasta dough, wonton wrappers are available in most grocery stores in the Philippines and each pack has about 100 pieces of wrappers. More than enough to feed your family minus the mess! Also, I know that not all households are equipped with pasta makers and the elbow-grease you would need to knead (I like to rhyme sometimes!) the pasta dough is just exhausting to even think about! Link to the Spinach Wonton Ravioli recipe on The Spoiled Mummy's blog! Sauté garlic, chopped spinach and mushrooms until wilted and cooked, about 2-3 minutes. Mix in cooked and cooled spinach and mushrooms with mozzarella, parmesan and cream cheese. Season with Salt and pepper. 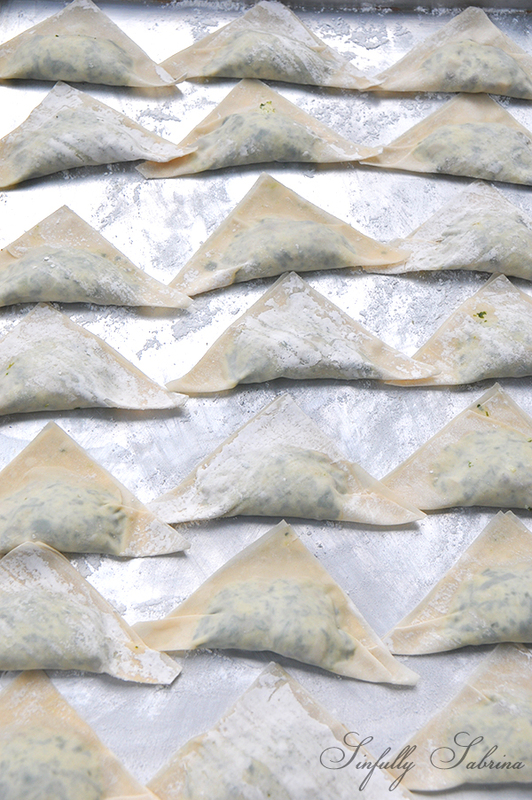 Spoon ½ Tablespoon of the spinach mixture onto the middle of a wonton wrapper, wipe or brush edges of the wrapper with egg whites and fold over to make a triangle. Lay on a baking sheet with a sprinkle of flour at the bottom to prevent from sticking. In a saucepan, fill with water and let boil. Add salt when water begins to boil. Drop wonton raviolis one at a time, 5 pieces maximum can go in at the same time, cooking for 2-3 minutes each. Lay 3-4 raviolis on each serving plate/bowl. Spoon tomato cream sauce (recipe below) over wonton raviolis. Garnish with parmesan cheese and a sprig of parsley. In a large saucepan on medium-high heat, sauté onions for 2 minutes and add garlic, salt and pepper. Sauté for another minute. Pour canned tomatoes, chicken broth, water, dried basil and sugar in the sauce pan. Bring to a boil, lower heat and simmer for 20-30 minutes, stirring occasionally. Add the all purpose cream in the tomato sauce, bring to boil and simmer again for another 10-15 minutes, stirring occasionally.